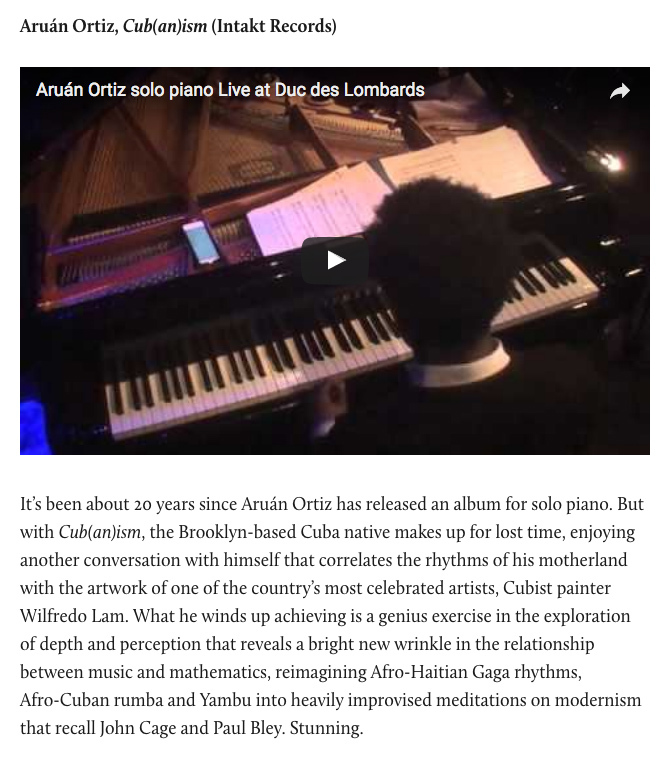 ARUÁN ORTIZ, der Kuba 1996 zuerst Richtung Spanien verließ, ist, nach sechs Jahren am Berklee College of Music in Boston, 2008 in Brooklyn an- und ganz zu sich gekommen als Piano-Kubist. 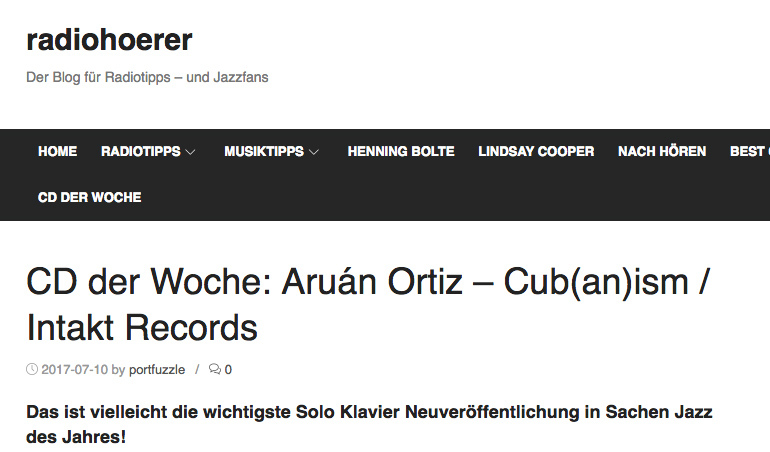 Meist mit eigenem Trio (wie bei "Hidden Voices" schon letztes Jahr auf Intakt), aber auch im Michaël Attias Quartet auf Clean Feed. 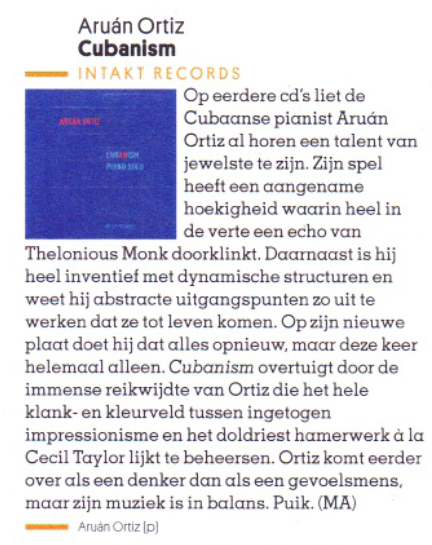 Cub(an)ism (Intakt CD 290) zeigt ihn nun solo, als von Muhal Richard Abrams in seiner Stoßrichtung bestärkter Tasten-Mastermind zwischen kubanischen Wurzeln und Xenakiscience. Für erstere stehen, wenn auch melancholisch abstrahiert, zugleich klirrend gehämmert, 'Yambú' (die älteste Form der Rumba) und das Yubá hinter der spröden Mechanik von 'Monochrome', das die von 'The Peanut Vendor' und 'When Yuba plays the Rumba on the tuba' an­gestoßene 'Cuba Invasion' Anfang der 1930er ihrer albernen Klischees entkleidet. Geschichtsbewusst im kritischen Sinn ist gleich 'Louverture Op. 1 (Château de Joux)', indem es mit seinen afrohaitianischen Gagá-Rhythmen an Toussaint Louverture erinnert, den Anführer der haitianischen Revolution, der 1803 als Gefangener im Château de Joux umkam. Hinter den sprunghaften und präparierten Klängen und der zerrissenen, trillernd gequirlten Motorik von 'Cuban Cubism' steht Wifredo Lams dramatisches Gemälde 'The Jungle' (1943), ein Zerrspiegel aus Santeriá und Zuckerrohrfluch, den er in die Träume der Ausbeuter zu hexen versuchte. In 'Sacred Chronology' verbirgt sich eine Fibonacci-Reihe. Ortiz verweigert sich der Erwartung latinesker Geschmeidigkeit, er agiert sperrig, hartnäckig, kristallin und kantig, die Rechte und Linke gern auffallend unabhängig, sein Arpeggio transportiert Neben- und Hintergedanken, Bruchstellen und Splitter. Das Horizontale bei 'Passages' wechselt mit dem ab- und aufsteigend gestuften 'Intervals (Close to the Edge)'. Dominante Kraft ist jedenfalls nicht die schnelle Hand, sondern ein scharfer Verstand wie hinter dem ostinanten Drehwurm 'Dominant Force'. Der sich jedoch zuletzt der tiefen Wehmut von 'Coralaia' beugt. 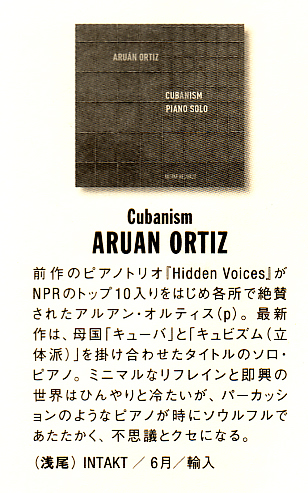 Hidden Voices (Intakt Records, 2016) brought Cuban born pianist and composer Aruán Ortiz some long-overdue recognition in the U.S. Cub(an)ism, Ortiz' tenth release, is a solo piano outing and his first such recording in the stand-alone format. 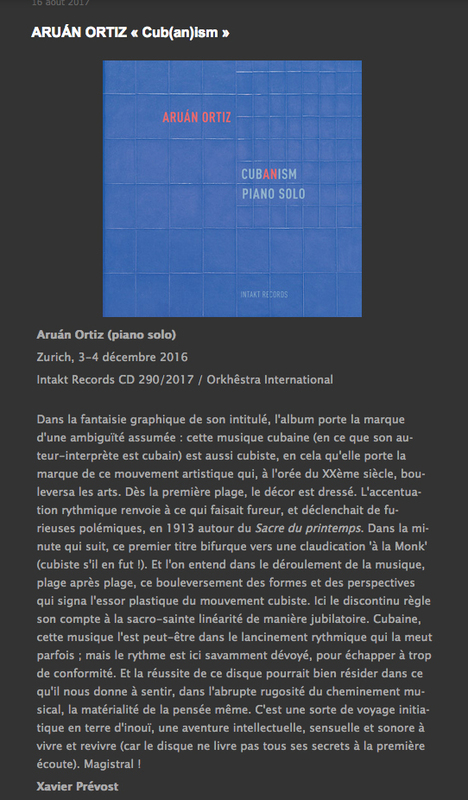 Recorded in 2016 in Zürich, Switzerland, the album continues Ortiz' exploration of Cuban Cubism, his method of incorporating cubist principles of faceting and multiple perspectives with folkloric elements. 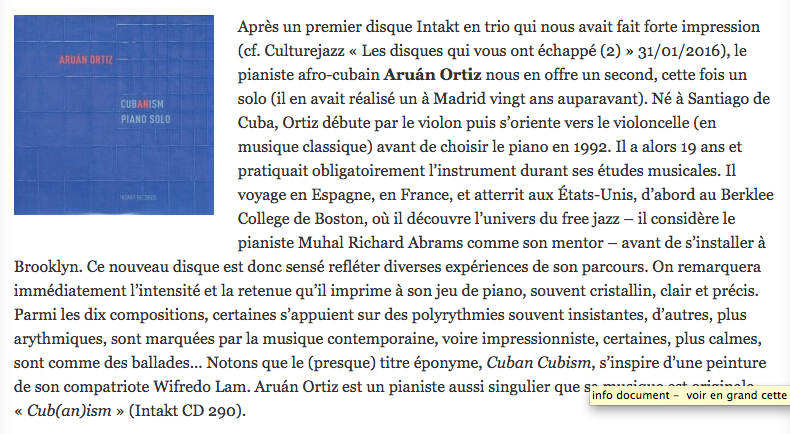 Cub(an)ism consists of ten original Ortiz compositions that blend Afro Cuban and Afro Haitian tradition with the influences of Spain, France, and the U.S., all locations in which Ortiz has lived. The allusion to cubism is not a generalized throw-away phrase, but very much part of Ortiz' creative process that can be heard and visualized in these pieces. 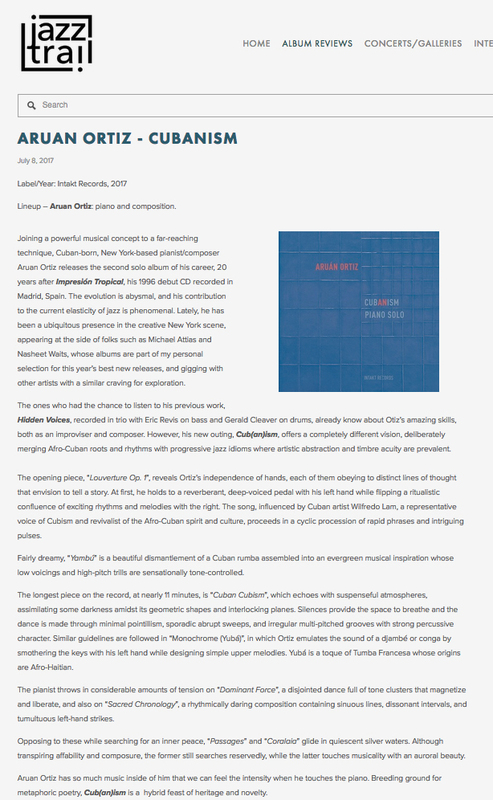 The marriage of visual and musical composition has long been an element in Ortiz' thinking and one can hear this influence in most clearly in the solo setting. 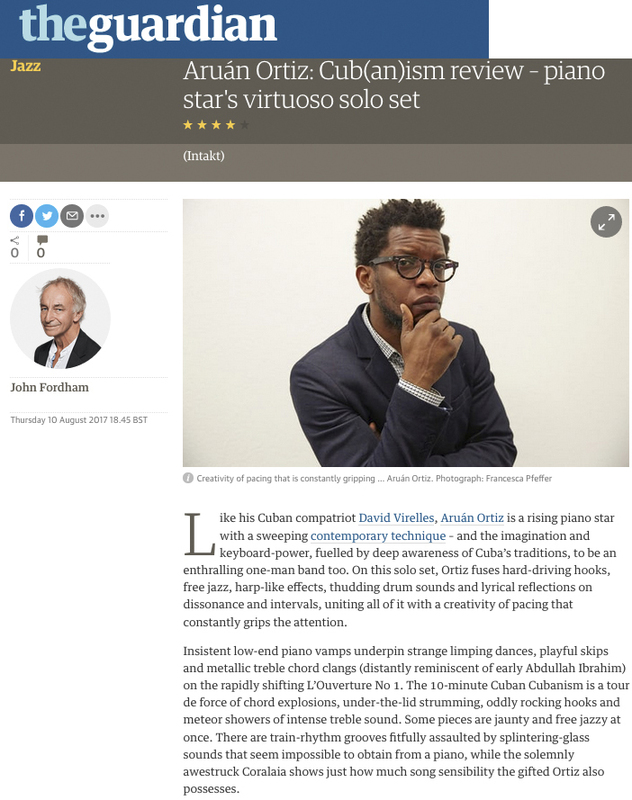 The percussive, avant-garde opener, "Louverture Op. 1 (Château de Joux)," integrates at least three distinct themes amidst vacillating tempos and more than a hint of classical inspiration. "Cuban Cubism" is the embodiment of Ortiz' approach; a minimalist approach builds slowly then pulls back briefly. Over the course of almost eleven minutes, the piece flashes through varying backdrops, miniature melodies and abstractions. The native influences of rumba and yambu can be experienced on "Monochrome (Yubá)" as Ortiz plucks strings, accompanying himself through wavering rhythms. 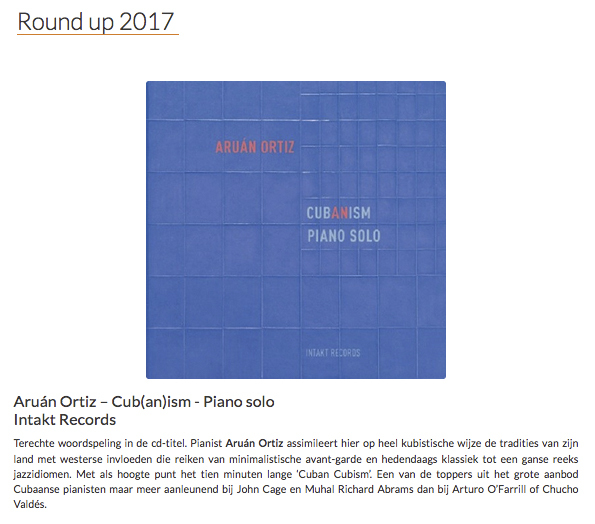 Ortiz displays remarkable virtuosity across the variety of musical and non-musical disciplines that come into play on Cub(an)ism. He employs Indian mathematics as the framework of "Sacred Chronology," simple-to-complex repetitions on "Dominant Force" and quite lyricism with "Intervals (Closer to the Edge)." The meditative and unadorned "Coralaia" closes the album, with the reverence of sacred music. 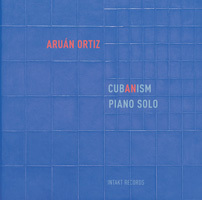 Ortiz in the solo setting is exceptionally intriguing and for all the theory and extended technique in play, the music is superbly listenable and refreshingly original. 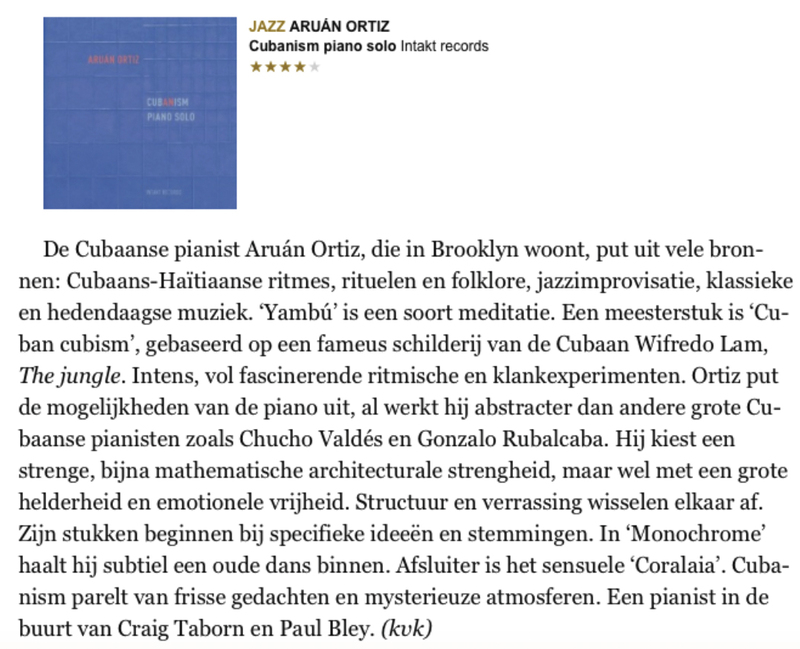 Coming hard on the heels of last years superb trio album, Hidden Voices, Cuban born and Brooklyn based pianist Aruan Ortiz moves into even more deeply personal territory with an angular and fiercely played album of solo piano. 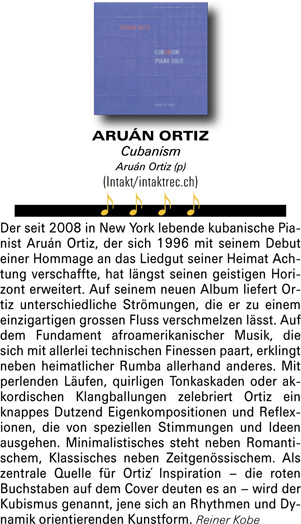 This album is the result of an interesting convergence of musical ideas and styles, which draws upon the variety of musical and personal experiences of Ortiz’s life, as a musician and a world traveler, and as one who is relentlessly curious and humanistic musician and individual. 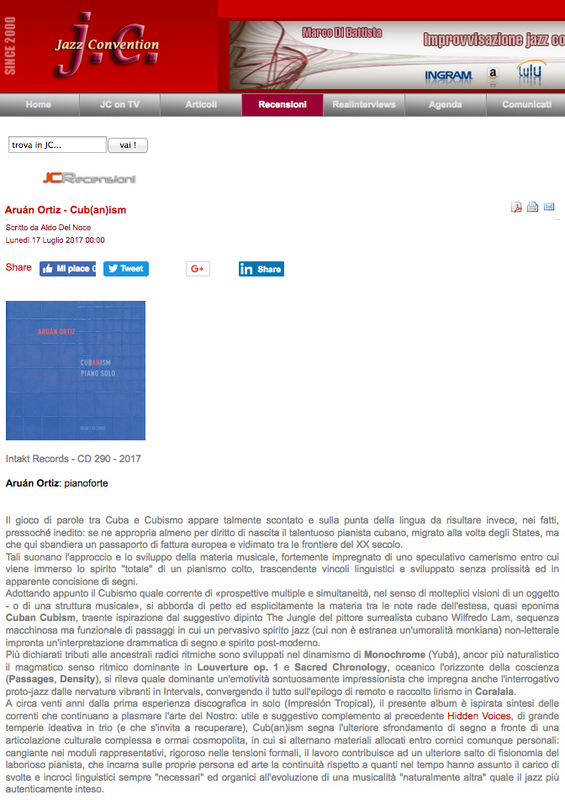 On this album, Ortiz’s compositions are derived from well developed thoughts and sensations, and they course along synaptic constructions which are shot through with the unexpected, allowing the music to flow naturally and organically. He plays the length and breadth of the instrument, with blasts of powerful lower end bass notes and chords that ring and resonate with astonishing clarity throughout the music. While he has a definite stylistic approach to the music, the music on this album remains diverse at all times. Using clear but flexible approaches, the music engages through structure and surprise, as well as tension and release. Clear and shimmering musical constructions are abruptly altered as the deep rhythmic nature of the music asserts itself. Each of the performances has a unique mood of their own. 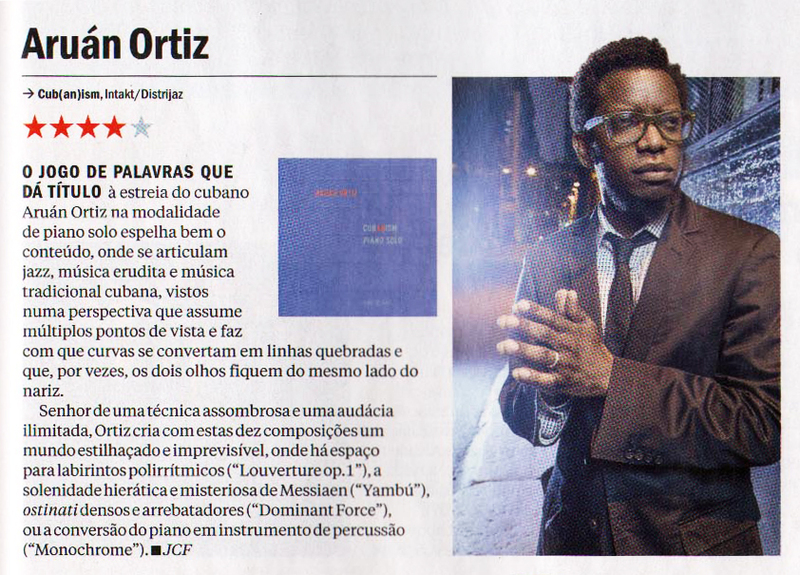 Ortiz makes carefully structured music into a compelling mix of sounds, rhythms and improvisation. All these elements combine to make a very unique sound. Musical forms converge like eddies, swirls and whirlpools of sound in a grand current, but Ortiz maintains the vision to keep the music under control. This album works quite well, with the music ranging widely in the traditions of jazz piano while keeping melodic structure at the forefront. 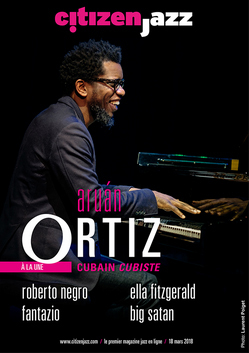 The Cuban influence infuses Ortiz’s music with further drama that jolts the proceedings like a burst of electricity, creating interesting structures that allow for flowing improvisations and continually interesting music.